Over the past 6 six years, the primary cause of new drug candidate failures (50%) has been failure of therapeutic efficacy. Put another way, drug discovery programs do everything right, get the defined candidate molecule, only to have it fail in therapeutic trials. Among the most prevalent reasons proposed for this shortcoming is the lack of translation of in vitro and recombinant drug activity to therapeutic in vivo whole systems. Drug activity in complete systems can be characterized with the application of pharmacological principles which translate drug behaviors in various organs with molecular scales of affinity and efficacy. Pharmacological techniques are unique in that they can convert descriptive data (what we see, potency, activity in a given system) to predictive data (molecular scales of activity that can be used to predict activity in all systems including the therapeutic one, i.e. affinity, efficacy). The predicted outcome of this process is a far lower failure rate as molecules are progressed toward clinical testing. Terry Kenakin presently is a Professor of Pharmacology in the Department of Pharmacology, University of North Carolina School of Medicine. The course is taught from the perspective of industrial drug discovery; Dr. Kenakin has worked in drug industry for 32 years (7 at Burroughs-Wellcome, RTP, NC and 25 at GlaxoSmithKline, RTP. NC). He is Editor-in-Chief of the Journal of Receptors and Signal Transduction and Co-Editor-in-Chief of Current Opinion in Pharmacology and is on numerous journal Editorial Boards. In addition, he has authored over 200 peer reviewed papers and reviews and has written 10 books on Pharmacology. Summary sheets, exercises with answers, relevant papers are included as well as a pdf of all slides. The course is based on the book A Pharmacology Primer: Techniques for More Effective and Strategic Drug Discovery. 4th Edition, Elsevier/Academic Press, 2014. This course will describe pharmacological principles and procedures to quantify affinity, efficacy, biased signaling and allostery to better screen for new drugs and characterize drug candidates in lead optimization assays. Cambridge Healthtech Institute’s Eleventh Annual Drug Discovery Chemistry is a dynamic conference for medicinal chemists working in pharma and biotech. Focused on discovery and optimization challenges of small molecule drug candidates, this event provides many exciting opportunities for scientists to create a unique program by going back and forth between concurrent meeting tracks to hear presentations most suited to one’s personal interests. New for 2016 is the addition of three symposia on Friday covering the blood-brain barrier, biophysical approaches for drug discovery, and antivirals. Make the most of your time in San Diego by adding on one or more short courses*. Topics include trends in physical properties, GPCRs, peptide therapeutics, immunology, phenotypic screening, crystallography, ligand-receptor molecular interactions, inhibitor design, macrocycles, FBDD, and covalent inhibitors. In a field where women hold many senior positions in actual US healthcare corporations, they are drowned out at this conference by the advancing horde of finance guys in red ties and the CEOs that love them. Union Square: Maps & Resources by MacDougall Biomedical Communications. This workshop is focused on delivering results and securing funding at All Levels: Boards, Angels, VCs, Corporate Partners and Other Sources of Funds, with four hours of intensive and interactive discussion, on-your-feet sessions, war stories and insights aimed at folks looking for financing. It is designed to accelerate your funding activities and eliminate unnecessary noise. Preregistration is required, more information can be found here. All Biotech Showcase attendees are invited to pick up name badges prior to the beginning of the conference on Monday. [ + ]Alzheimer’s disease: Has the tide turned? [ + ]Who’s investing in digital medicine? [ + ]Bubble trouble? Have the biotech bulls had their run? [ + ]The regulatory pathway: Is it getting clearer? Biotech Showcase™ is an investor and networking conference devoted to providing private and public biotechnology and life sciences companies with an opportunity to present to, and meet with, investors and potential strategics in one place during the course of one of the industry’s largest annual healthcare investor conferences. Investors and biopharmaceutical executives from around the world gather in San Francisco during this critical week which is widely viewed as setting the tone for the coming year. Now in its eighth year, this rapidly growing conference features multiple tracks of presenting companies, plenary sessions, workshops, networking, and an opportunity to schedule one-to-one meetings. Biotech Showcase delegates include investors in private and public companies, sector analysts, bankers and industry professionals, as well as biopharmaceutical and life science company executives. Biotech Showcase is produced by Demy Colton Life Science Advisors and EBD Group. Both organizations have a long history of producing high quality programs that support the biotechnology and broader life sciences industry. Whether you’re a conference veteran or a rookie, we hope this light-hearted guide helps you survive the week of life science mayhem in San Fransisco. At Chempetitive Group, we have a deep passion for everything life science—its people, its processes and its promise for the future. As life science marketers, this passion takes us to the industry’s biggest events every year, including the J.P. Morgan Healthcare Conference and related conferences each January. Over the years, we’ve learned our way around San Francisco’s Union Square—places we like to frequent. Each January, the J.P. Morgan Healthcare Conference – perhaps the life science industry’s largest and most frenzied conference of the year – reliably draws thousands of investors and executives across the healthcare sector to San Francisco’s Union Square neighborhood as hundreds of companies present their latest innovations and dreams in an attempt to pique the interest of venture capitalists and potential partners. In addition to J.P. Morgan, parallel events Biotech Showcase, OneMedForum and RESI Conference ensure that there is a high density of biotech brainpower and capital in the City by the Bay. The conference week is a mix of long days of presentations and lively evenings of cocktail parties and networking events. With more than 50 networking receptions, days of sessions, and still a volume of work to manage while away from the office, you might need some guidance on where to take your client or potential partner for a meeting, where to refuel or caffeinate, or simply where to hide from the chaos. 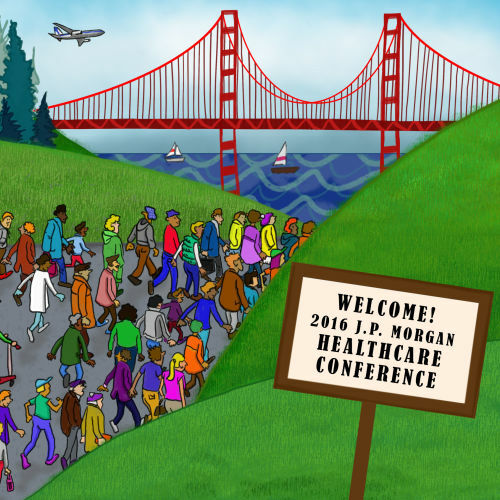 For these reasons, we decided to let you into our world by creating this simple guide to surviving the 2016 J.P. Morgan Healthcare Conference week. Download it and, if you happen to find yourself in one of our favorite spots, let us know with a direct message on Twitter at @chempetitive. Safe travels, have fun, and get some deals done. Oxford, UK, 04 January 2016: Genomics plc (“Genomics”), a leading analysis company developing algorithms, data resources, and software solutions to uncover the relationships between genetic variation and human disease, today announced that Vertex Pharmaceuticals will use Genomics’ integrated database and state-of-the-art analysis tools to inform its drug research and development. These tools aim to provide confidence in the rationale for targeting Vertex’s pathways of interest for the treatment of certain diseases and to identify potential safety concerns and repositioning opportunities. Genomics has developed a unique analytical platform for genome analysis and interpretation. The platform combines proprietary algorithms and software with the Company’s integrated genome-phenome database and analytical expertise to learn about human biology. Genomics has several existing partnerships with large pharmaceutical companies, and in clinical genomics is a Platform Partner for Genomics England, the company undertaking the 100,000 Genomes Project in the UK. Genomics was founded by four leading Oxford academics, including Professor Peter Donnelly, Director of The Wellcome Trust Centre for Human Genetics, and Professor Gil McVean, Director of The Big Data Institute. The Company has developed a unique platform for genomic sequence data analysis and interpretation which combines world-leading expertise in statistical analysis and data mining with a unique integrated database linking genotypes and phenotypes. Genomics England, the company running the UK project to undertake whole genome sequencing of 100,000 patients in the National Health Service, has appointed Genomics plc as a Platform Partner and has also awarded the Company three SBRI grants. Genomics plc is also working with four major pharmaceutical companies to bring the benefits of genomic analysis to their drug development processes. The Company is supported by major investors, including IP Group, Invesco Perpetual, Woodford Investment Management and Lansdowne Partners. Top Bay Area Innovators For the first time, Thomson Reuters analysts studied Silicon Valley, known as the technology and innovation corridor in the US, to see which companies are leading there. Following a methodology similar to that of the Top 100 Global Innovators, except for the Volume criteria, all companies headquartered or with a major subsidiary in that region were investigated. The Top Bay Area Innovators list can be found on page 19. There are 11 companies that overlap with the Top 100 Global Innovators; meaning 31 percent of the leading US innovators and 11 percent of the world’s top innovators are located in the Bay Area. The United Kingdom is absent from the list yet again this year. Innovation incentives introduced in the UK, such as Patent Box legislation, do not have enough legacy yet to have had an impact. Additionally, the UK spends much less on R&D as a percentage of Gross Domestic Product (GERD) than the Top 100 Global Innovator countries do. The UK’s GERDis 1.63 percent, whereas, for example, Japan’s is 3.47 percent.5 The region’s underuse of its patent system and lack of significant commercialization keep the UK from making the list once again. China is also absent from the 2015 list. It joined the innovation-leader ranks in 2014, for the first time, via Huawei, however wasn’t able to replicate that performance to join again in 2015. A big factor contributing to China’s shortcoming is the fact that most of its innovation is domestic and therefore is not realized outside of its borders. In fact, only about six percent of China’s innovation activity is protected, and commercialized, outside of China. In order for China to see more organizations join this prestigious group, it will need to think more internationally and look to bring its inventions to market around the world. There are 27 companies that dropped from the prior year (see Table 1 on page 12), including AT&T, IBM, Siemens and Xerox. While these companies are still innovating at noteworthy levels, their respective scores across all of the metrics did not advance them to the Top 100. It’s expected that we will see them again in the future. There’s been some influential intellectual property legislation that is shaping how companies innovate, where they seek protection and when. Some of these initiatives include the America Invents Act and the Patent Trial & Appeal Board; the European unitary patent and unified patent court; the UK’s Patent Box legislation; and impactful court rulings, such as Alice 101 in the US. The landscape is ripe with reform as patent offices and filers grapple with how best to implement these changes given their goals and needs. Despite these changes, one thing remains certain: the patent system is vital to protecting innovation and to the economic wellbeing of organizations, nations and our world. OECD statistics confirm that nations with higher GDPs have similarly high patent filing rates (aka strong patent infrastructures), whereas the converse holds equally true. One way for developing nations to propel their economies forward is to invest in innovation and building a reliable intellectual property infrastructure. using Thomson Reuters solutions including Derwent World Patents Index (DWPI), Thomson Innovation and Derwent Patent Citations Index (PCI). Volume is the first criteria. An organization must have at least 100 unique inventions protected by a granted patent over the most recent five year period to advance for further analysis. A unique invention is defined as one instance of a published application or granted patent for an idea for which protection is sought. In DWPI, these are called “basic” patents. DWPI provides access to 50 patentissuing authorities. Subsequent filings for the same invention are recorded as equivalents and collated into patent families which, for this analysis, were not included. Once an organization passes the volume stage gate, it is measured across the next three criteria: success, globalization and influence. The success metric covers the ratio of inventions described in published applications (those patents which are filed and publicly published by the patent office but not yet granted) to inventions protected with granted patents over the most recent five years. Not all patent applications pass through the examination process and are granted. influence is the downstream impact of an invention, measured by how often it is cited by other organizations. Via the Derwent Patent Citation Index, citations to an organization’s patents are counted over the most recent five years, excluding self citations. Scores for each of these areas are tallied and combined to produce the Top 100 Global Innovator list. In molecular biology and pharmacology, a small molecule is a low molecular weight (<900 daltons) organic compound that may help regulate a biological process, with a size on the order of 10−9 m. Most drugs are small molecules. As shown there were 106 small molecules approved and 59 biologics approved in 2014. Sales figures were or their anticipated market size as well as cost/benefit analysis. This was mentioned as a very important requirement in drug development by JNJ. The pharmacy benefit managers, insurers and the pharma companies said they were talked early in the drug development process using cost/benefit analysis as a criteria of go/ no go decision point. The insurers are very cost conscious as well as the PBMs. There are some classes that had mainly biologics and this was not oncology. In addition inflammation had lots more small molecule. The breakdown seems to be more meaningful than the totals and there are many reformulations and double indications. Bio Pharma is an “evolving accelerating science” (John J. Castellani, PhRMA). it represents 1 in every 5 dollars spent on domestic R&D in the US. 6199 Clinical Trials in 2013. There is a necessity for the highest quality manufacturing environments. These are the keys to operational excellence. Deloitte estimates that PAT can promote fewer recalls and less scrap inventory. A recognized potential for small molecule drugs, and some companies have developed this continuous technology. Deloitte’s study says that FDA views continuous manufacturing as consistent with the FDA’s quality by design efforts. How to define a batch in case of product recall is a true challenge, which means that new measurements methods are needed. Continuous manufacturing opposed to efficient, well-planned and engineered facilities, which is the vision developed by Amgen and others innovative players. January 21 – 23, 2016 ………….http://www.nipicon.org/. The pharmaceutical sciences is a dynamic and interdisciplinary field that combines a broad range of scientific disciplines that are critical to the discovery and development of new drugs and therapies. Over the years, pharmaceutical scientists have been instrumental in discovering and developing innovative drugs that save people’s lives and improve the quality of life. NIPiCON was initiated in a year 2013 to offer a common platform for academicians, researchers, industrialists, clinical practitioners and young budding pharmacists to share their ideas and research work and finally emerge with new concepts, innovations and novel strategies for various challenges in the pharmaceutical field. The 3 International Conference, NIPiCON 2016 aims to provide a knowledge sharing experience in the area of “Global Challenges in Drug Discovery, Development and Regulatory Affairs”. Pharmaceutical innovation is a complex creative process that harnesses the application of knowledge and creativity for discovering, developing and bringing to clinical use, new medicinal products that extend or improve the lives of patients.A successful pharmaceutical R&D process is one that minimizes the time and cost needed to bring a compound from the scientific ‘idea’, through discovery and clinical development, to final regulatory approval and delivery to the patient. This conference will provide an open forum for the academicians, researchers, clinicians and professionals of pharmaceutical industry to enrich their knowledge in the area of drug discovery, development and its regulatory requirements. The conference features plenary sessions which will be delivered by eminent national and international speakers from different disciplines of pharmaceutical field. In addition, there will be invited lectures and sessions delivered by distinguished and young researchers in their respective fields during parallel technical sessions. The conference willalso provide the opportunity to scientists and research scholars from various organizations to put forth their innovative ideas and research findings by means of deliberations, discussions and poster presentations.